December is the best time to travel as the weather is most favorable making the a little more beautiful, especially if winter is your favorite season. In the peak of holiday season in India, you have plenty of options to plan a short weekend getaway or a long winter vacation. Be it the serene beaches in South India or the snow-laden Himalayas in the North, you will have the best time traveling in India during the month of December. 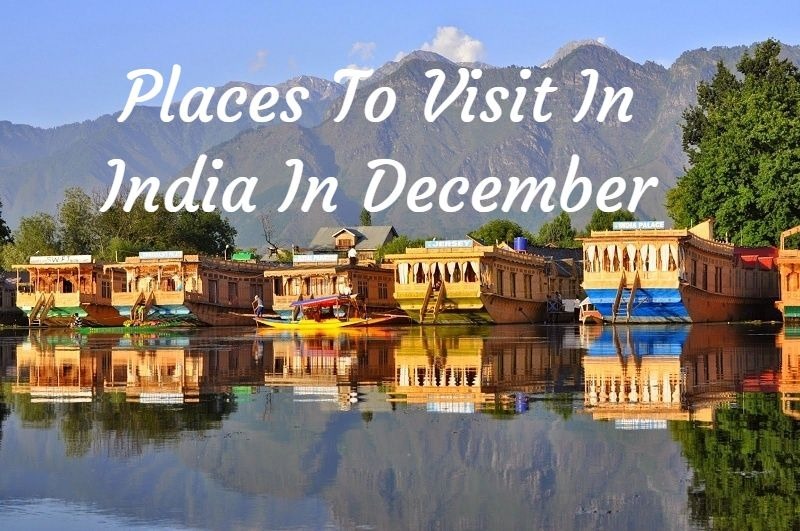 To help you decide the ideal winter destination, we have jotted down the most suitable places to visit in India in December. Keep reading. Talking about the best destinations to visit in December, the name to top our list is Chopta in Uttarakhand. Whether you are an adventure seeker or peace lover, this spectacular place will bring you both. Allure the awe-striking view of the snowcapped peaks Trishul, Chaukambh and Nanda Devi. You will feel a romantic freshness in the air and the trip won’t just limit to experiencing the splendid snowfall but you can go on great trekking trails on the peaks as well. Get some rush of adrenaline this winter. Uttarakhand is home to several winter destinations of India and the second on our list of best places to visit in December in India is Binsar. It is known as the sleepy hill station nestled in the lap of the breathtaking Nanda Devi, Trishul and Pachachuli. The place is best known for its dense and serene forests, Zero Point for the the panoramic view of the snow covered peaks (Himalayan peaks) such as Kedarnath and Nanda Devi and some more scenic miracles for the onlooker. Binsar is the dream destination of every writer, poet and photographer. Have you ever wished to go on a frozen ice trek? You can fulfill your wish this December by visiting Leh-Ladakh. The slippery crystal blue ice with the misty and snowy hills at its backdrop creates a flabbergasting view. You will get to experience enthralling adventure when on the Chadar Trek and also try covering some other fantastic treks like Samboo to Khalsar Trek, Sham trek and Liker to Khaltse trek. Worried about the chilling winters? Well, a cup of hot chocolate will make you feel otherwise. To explore the area this winter, book cheap flight tickets from USA to India or from any other countries abroad at Indian Eagle. Remember that song “Socho ke Jheelon ka Shehar ho” from Mission Kashmir? How about recreating that very scene with your beloved? Romantic, isn’t it? Srinagar is one of the best places to visit in December in India for honeymoon. Escape to this romantic hideaway this winter and feel loved with your partner. Enjoy skiing in Gulmarg and dare not miss the extraordinary Gulmard Snow Festival organized every year in the month of December. Gulmarg is only at proximity of 50 kilometers from Srinagar. Be it the situation of booking the last minute flights, but you need to travel the snowcapped mountains of Jammu & Kashmir this December. Being an avid traveler, you must have heard about the music fests and concerts held in Goa during the winter holiday season. Why not experience one this time? Every year in December, the very popular band Sun Burn turns New Year mesmerizing. Goa, the one of the best places to visit in December organizes several other music festivals like the loudest EDM party, VH1 Supersonic and the feast of St. Francis Xavier. MAKe your Christmas and New Year 2019 kickass with your friends in Goa. Have recently booked business class flights to Goa for a conference? No worries, take out some time for yourself and get a much needed break at Small Vagator. One of the most popular beach destinations in India, Radhanagar Beach in Havelock Island of Andaman turns out to be gorgeous in the month of December. Soak in the stunning curves of white sands, dive in the blue waters and relax by the tall palm trees this winter. Located only 12 kilometers from the Havelock’s ferry pier, it holds the title of “Asia’s best beach”. Wouldn’t you like to explore the wonder yourself? As we have talked about the most popular places to visit in India in December, we thought to include an amazing offbeat destination to our list – Tawang. Though one of the most difficult-to-reach spot in December in India, the magnificent Himalayan peaks in Tawang look gorgeous and awe-striking. Explore the ancient monasteries of the state and the colorfully wrapped valleys with prayer flags. Find solitude and peace in the Tawang Chu River, Chong-Chugmi and Gudpi ranges and Tawang Valley. Revealed: Flight Attendants’ Pet Peeves You Didn’t Know about!